At 43m/140ft and able to accommodate up to 100 guests dockside, superyacht HANA is the perfect venue for corporate events throughout the Mediterranean. Accommodating up to 10 guests during travel, HANA contains a large master suite with its own veranda, three double cabins and two twin cabins. With contemporary interiors designed by Claude Missir, grand deck spaces and hi-tech amenities, HANA is sure to leave a lasting impression. Light wood and pale colours enlarge the spaces and make the peaceful indoor lounges perfect for reading and relaxing before a meal in the elegant dining area.The Jacuzzi offers unbroken views of the local scenery and there is plenty of lounging space to soak in the sun or enjoy a cocktail at the bar. The fully-equipped gym will ease the guilty consciences of any guests who have overindulged and a large swim platform creates easy access to the warm Mediterranean waters. Not only is HANA equipped with a variety of water toys such as wakeboards, jet skis and water skis, she is also an approved RYA water sports training centre – perfect for learning new skills and activities. 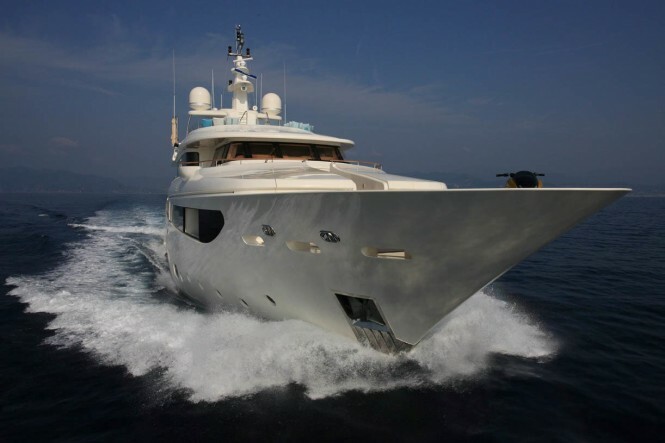 Until the end of June, luxury superyacht HANA is offering charters around the Mediterranean at the reduced rate of €120,000 per week (plus expenses). -----> Book now to avoid disappointment.